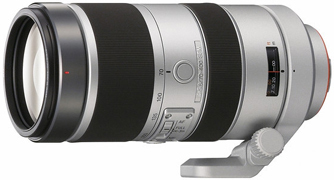 The Sony 70-400mm f/4-5.6G SSM A Mount Lens sports three focus hold buttons for superior control, plus an electronic slider focus range selector switch. The Super Sonic Wave Motor produces smooth, silent autofocusing that has a rapid response time. When used with the a900 Digital SLR camera, the AF hold buttons can be customized to activate the intelligent preview function. This lens is ideal for outdoor distance shooting, wildlife photography, sports, and outdoor portraits. This lens is compatible with APS-C (crop frame) and full frame sensor Sony Alpha A Mount camera bodies. It is not compatible with NEX cameras or full frame E Mount cameras.